Former Andhra Pradesh chief minister Kiran Kumar Reddy Thursday moved the Supreme Court challenging the bifurcation of Andhra Pradesh to create a Telangana state, contending it was against the constitutional provisions and for political expediency.Kiran Kumar Reddy, who resigned as chief minister as well as from the Congress, has sought a declaration that the Andhra Pradesh Reorganisation Act 2014 was unconstitutional as it violated the constitution's basic structure and has been enacted without following the due procedure of law and the constitutional provisions.His plea that will come up for hearing along with a batch of petitions, contending that the central government pushed for the carving out of Telengana without considering Srikrishna Commission report which was mandatory as per the settled legal positions. It also said that going by the recommendations of the Group of Ministers was not a valid procedure in law as the GoM was not an expert body. "Non-consideration of the report of Srikrishna Commission while taking the decision regarding bifurcation of the state is plainly unconstitutional. When an expert body was appointed, its views either should be accepted or rejected," his plea said. The petition said that there are certain implied limitations on the power of parliament and while carving out new states from the existing States, it can't exercise unlimited power without giving due regards to the views of the state assembly. Kiran Reddy's plea said that the implied limitations on parliament's power come into play with regard to the basic features of the constitution.Parliament under article 3 of the constitution, the petition said, could only alter or adjust the boundaries but not extinguish an existing states. 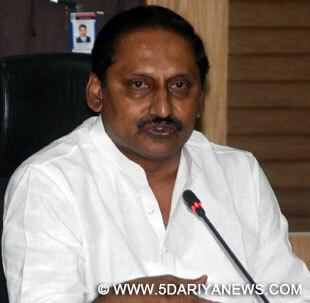 "The power of parliament to alter the boundaries of states without their consent is a breach of federal principle and that parliament on its own has no power to alter the boundaries of states," the petition said.Kiran Reddy said that under the constitutional convention, formation of a new state would follow the recommendation of a State Reorganisation Commission and any similar panel and whether a departure could be made from following such a procedure for bifurcating Andhra Pradesh for carving out Telengana.The formation of the three new states - Uttarakhand, Jharkhand and Chhattisgarh - was preceded by unanimous resolutions of the concerned state legislatures, he noted. "The unanimous view of the legislature is a strong reason supporting the principle of federalism that the concerned states themselves seek alteration of boundaries and to that extent one may justify parliament making a law in deference to the wishes of those legislatures," the petition contended. "In a federal set up, where the states share considerable degree of sovereignty with the Union, the latter cannot act unilaterally in disregard of the wishes of the states."